This September, I visited the Advocates Library at Parliament House on the Royal Mile. It was open to the public during Edinburgh’s annual Doors Open Days. I had long wanted to visit Advocates’ Library and was planning to contact Parliament Hall to arrange one, but DOD made this much easier! 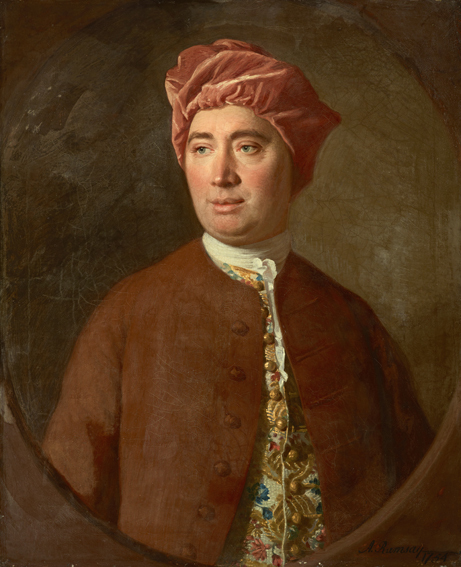 The philosopher who first brought me here to Edinburgh, David Hume, was the keeper of the Advocates’ Library from 1752-1757. The Library was founded by George Mackenzie in 1682. Now strictly a law library, it originally acted as Scotland’s library of deposit, which, since 1925, is now the function of the National Library of Scotland. The original building which housed the Advocates Library burned down in the great fire of 1824. Just as it happened with the destruction of two-thirds of the Library of Congress’ original collection in 1851, once Thomas Jeffersons’ private library, the surviving books from the original Advocates’ Library collection retain scorch marks. The library I visit today was completed in 1830 and designed by renounced Edinburgh architect William Playfair. The site of James Boswell’s place in James Court off the Royal Mile is near one of my favorite pubs in Edinburgh: the Jolly Judge. You can see the plaque on the wall near the doorway just beyond the lamp. In James Court, just off Edinburgh’s famed Royal Mile, there’s a little winding set of stone steps leading to a simple wood door. The plaque near the steps reveals that they lead to the place where James Boswell lived from 1773 to 1786. The first flat that Boswell occupied in James Square was torn down, but the recently discovered remains of a very old staircase in one of these oft-reconstructed buildings may be the one which linked the two floors of his home. From what I’ve read thus far, it seems this marked building, site of Boswell’s second flat here in James Court, contains only parts of the original structure. Boswell, the Edinburgh-born lawyer, diarist, and writer most well known for his biography of Samuel Johnson, has connections to two towering figures of the Enlightenment: David Hume and Jean-Jacques Rousseau. The ways in which his life intersected with theirs exemplify his vibrant and complex life and personality. Ten years earlier, Boswell played a part in destroying the trust and friendship between Hume and Rousseau. Hume had agreed to help Rousseau, who was fleeing political persecution in Europe, find safe haven in England. Mutual admiration and a warm friendship sprung up between the two menimmediately though Baron d’Holbach (another mainstay of the French Enlightenment community) warned Hume that Rousseau was not to be trusted. This proved true. Rousseau’s growing paranoia led him to believe that Hume was plotting to destroy him and began to spread word of Hume’s perceived deviousness. The unraveling situation was not helped when Hume’s friend Boswell, charged with escorting Rousseau’s beloved mistress Thérèse Le Vasseur to join him in England, had an affair with her along the way. Rousseau believed that Hume had helped orchestrate this betrayal as well. Aware of Boswell’s notoriously insatiable sexual appetite, Hume certainly showed very poor judgment in trusting Boswell with this task. Before long, Hume and Rousseau became bitter enemies. Hurt and angry, Hume attacked Rousseau publicly as well, sometimes in very unseemly ways, and the whole episode revealed that even the most wise can also be the most foolish. Another view of the site of James Boswell’s home in James Court. This would have been the second and larger flat that Boswell occupied here; the building which held the first, formerly David Hume’s, was torn down. James Boswell portrait in the National Portrait Gallery, Edinburgh, Scotland. Boswell’s diary of Samuel Johnson has been called the greatest biography in the English language. I visited this portrait during my journey to Edinburgh in 2014 following the life and ideas of David Hume, my favorite philosopher, if I had to name just one. Boswell sat at the bedside of the dying Hume and marveled at his composure in the face of suffering and death.